Did you know that the way your baby is positioned in your belly can have a tremendous impact on your labor and birth experience? I recently attended a fantastic training in Optimal Fetal Positioning with Juli Tilsner (LM, CPM) of Cornerstone Doula Trainings and I’m excited to begin implementing the things I learned into my work with my clients! Optimal Fetal Positioning refers to everything you, your care providers, and your birth support team can do to ensure that your baby is in the best position for birth. The optimal position is the one that ensures the baby is lined up so as to fit through your pelvis and the birth canal in the most efficient way possible. Though this depends on the type of pelvis you have, for most people, the positions “left occiput anterior” (or LOA) and “right occiput anterior” (ROA) are the most optimal for birth. 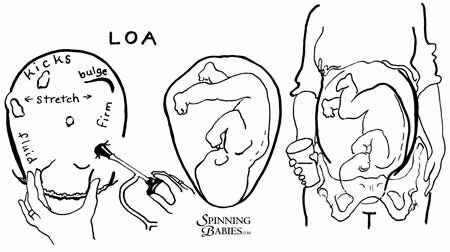 LOA means that your baby is head-down, facing your back, with her spine along the left side of your belly. ROA is the same position but with baby’s spine along the right side of your belly. In these positions or, your baby’s head is able to press evenly on your cervix to start labor when it is time and to ensure that labor progresses steadily. Babies rotate, shift, and mold slowly throughout their journey through the pelvis and into the world. Helping your baby get into the most efficient position helps support her in that journey. Fortunately, you don’t have to worry about whether or not your baby is perfectly LOA or ROA as her birth approaches. These positions are not every baby’s optimal position for birth, because every body is different. Your baby may prefer to be posterior (also called OP, this position means your baby is head-down, facing your front instead of your back). The good news is that utilizing the tricks and tools described here will ensure that your baby is in the best position for your baby and your body. These activities help to optimize her position, rather than forcing her into any specific position. If you are conscious about posture, alignment, and getting bodywork when needed on a regular basis, your baby is likely to settle into the most efficient position for birth. It can be useful to have a skilled doula or birth partner who can help you during labor if the baby needs to change her position in order to relieve pain, restart a labor that has slowed down, or ease back labor. Some of the signs of malposition you may experience before labor begins include back pain, sharp pain at the front of your pelvis (pubic symphysis), feeling hands and feet at the front of your belly, and premature rupture of membranes with no contractions. Why do we need to practice Optimal Fetal Positioning? We spend a lot of time sitting (in the car, on public transit, in the office, at home). Frequent sitting causes ligaments and muscles to be tighter than they should be in some areas and looser than they should be in others. Most notable among these is the Psoas muscle, which wraps around your pelvis from your spine and can pull your pelvis out of alignment. Most cars have “bucket seats” which cause our hips to sit lower than our knees. We don’t always carry ourselves upright, using good posture. Stress and being in chronic fight-or-flight can cause our muscles to be tighter than they were meant to be. Many of us have been injured in car accidents, falls, etc. that result in pelvic subluxation (being out of alignment). What can I do to practice good positioning and alignment? Below are some suggestions for ensuring that you have good alignment and posture and that your baby is encouraged to be in her ideal position in your belly. Please keep in mind that each of our bodies is unique, and if any of these suggestions feel uncomfortable or cause pain, do not do them. These are only suggestions, and like many suggestions offered to pregnant people, please take what you want and leave the rest. After about 28 weeks, your baby begins to get big enough that practicing these things regularly can impact her position in your belly. It definitely won’t hurt to start them whenever, and you don’t have to feel bad if you aren’t able to stay on top of them as regularly as you’d like. Every little bit helps! Maintain an upright posture as often as possible and avoiding slouching, reclining, and leaning back. Keep the focus on ensuring your hips are above your knees when you sit. Use lots of pillows and bolsters behind your back and under your bottom where you sit to help you be comfortable and relaxed in an upright position. Build “nests” made of pillows in your area on the couch so you can relax there at the end of the day. Make an effort to sit on top of your sitz bones (literally, the bones you feel under you when you sit), which creates a more upright posture naturally. If you’re not sure where those bones are, try rocking back and forth while sitting and feel the bones underneath you. When upright and sitting on your sitz bones, your back gets straighter and your pelvis tilts forward. When sitting more on your bottom, you assume a slouched position and your pelvis tilts back. Consider purchasing a “wedge” seat for the car, like this one, to bring your hips and knees level (the cut-out section at the back takes the pressure off of your sacrum and coccyx bone). Find a chiropractor who has experience working with pregnant people and who can help align your pelvis. Find a practitioner of Mayan abdominal massage near you (see below for resources). Find a massage therapist that is skilled in working with pregnant people and especially with Psoas muscle release. Go to prenatal yoga classes that emphasize position in the practice. If it is comfortable for you, try sleeping on your left side towards the last couple of weeks of your pregnancy. This is especially helpful if your baby is in the posterior position. Think about gravity lending you a hand with this one. Your baby’s back is one of the heavier parts of her body, and it will naturally want to move towards the left side of your belly if you are sleeping on your left side. Swimming (belly down) and doing cat-cow yoga poses in the morning and evening can also help encourage optimal positioning. How can a doula trained in Optimal Fetal Positioning help during labor? A doula can suggest various positions and poses during labor that can help your baby as he shifts and molds through your pelvis. Depending on where you’re feeling pain (lower back, frontal pubic area, etc.) your doula can suggest getting into different positions through a few contractions to make it easier for your baby to move. Doulas use sheets, pillows, chairs, bolsters, stools, birth balls, and their own bodies to help you get into these positions and hold them for a while. What if I’ve tried everything and my baby still won’t turn? If you’ve practiced optimizing your baby’s position and he won’t get into left, or even right, occiput anterior, that’s OK! Even if your baby is breech, there can be valid reasons that a baby prefers to be in a certain position — perhaps your specific bodily anatomy encourages him to remain just where he is. Perhaps there’s a reason you don’t yet know that your baby prefers a certain position. You may find out after his birth, or you may never know. The important thing to remember is that if your baby is in a position during labor that causes you pain, there are some clear signs that a skilled doula or birth partner can see and they may be able to troubleshoot positional problems in the moment. It’s important to trust your baby and your body. You are the best person to birth your baby, and your baby was made for your body. You and your baby are not passive observers; you are active participants and partners in this process. Gingi Allen runs Pregnancy Movement and Optimal Fetal Positioning Yoga out of the Berkeley Yoga Center. Contact her at mamagingi (at) gmail.com for more info. Dr. William Ruch at North Oakland Chiropractic has experience adjusting pelvises during pregnancy. Flow Chiropractic in Berkeley is geared towards prenatal and family adjustments. Learn more about Mayan abdominal massage here and find a practitioner near you here. Spinning Babies is a fantastic online resource centered around fetal positioning for an easier pregnancy, labor and birth.